Organic matter decomposes and sediment takes its place during the fossilization process, turning bones to rock. Soft tissue and proteins do not stick around. 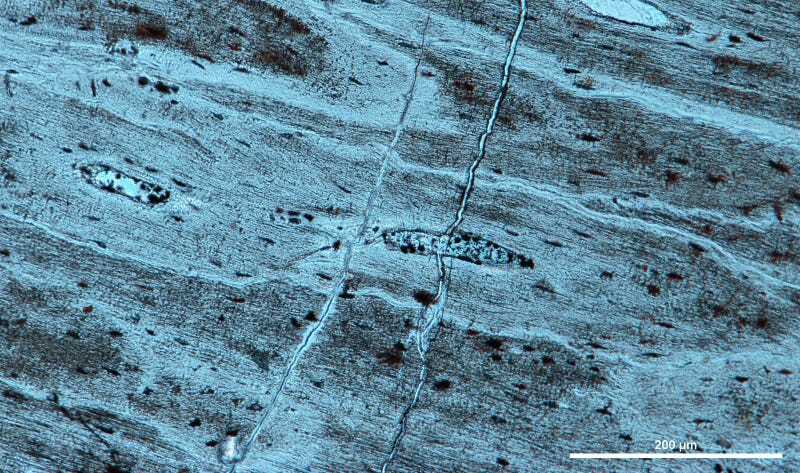 But in at least one 195-million-year-old dinosaur rib bone, some ancient bits of collagen protein found a way. A team of Chinese, Taiwanese and Canadian scientists used a kind of particle accelerator, called a synchrotron, to image a rib sample from Lufengosaurus, a 20-foot-long miniature brontosaurus-looking dino found in China, and found collagen proteins locked inside. The scientists also found hematite, an iron-containing mineral possibly left over from the dinosaur’s blood, that likely contributed to the preservation of the protein bits. Proteins are the way DNA manifests itself, so protein remnants can help scientists gain information on dinosaur biology and evolution that rock-like fossils alone can’t offer. The results, published today in the journal Nature Communications, revealed the kinds of protein traces that indicate degraded collagen fragments, which probably made up the blood vessel walls, and iron-containing hematite, which probably came from hemoglobin, the protein that carries oxygen in blood. “That’s the cool thing,” said Reisz. “There’s an association between these proteins and particles of hematite,” meaning the hematite could have assisted in preserving the proteins. For Reisz, the best part of the project was the international aspect. “It’s really neat to be able to collaborate across continents,” he said.